My hubby and three kids (ages 6, 4, and 2) are on an amazing adventure. We decided (somewhat spontaneously) that we would go cycle touring with our kids. Thus, we are making lots of mistakes and learning along the way. I must say though, that for total newbies, we’re not doing too badly. We’ve had lots of people stop to admire our cycle touring gear and a lot of people online ask about it, so I thought it was about time I wrote a blog post about it, so here it is! Dan is riding a Family Tandem Bike Friday, and K-girl, who is 6, is riding in it behind him. This is a true tandem, so her pedaling actually helps Dan. She has figured out that she can put her feet up on the frame of the bike, so she’s not actually pedaling too often, but she does help him when they’re going uphill. The awesome thing about this bike is that it is modifiable so that I could ride on the back as well, and either me or Dan could ride the front, even though there’s a sizeable height difference between us (Dan’s 6’2, and I’m 5’7). This bike is on the higher end of the investment scale, but it is worth it. We purchased our Bike Friday online at www.bikefriday.com, and Dan’s parents picked it up at the border for us (Bike Friday is a US company). Behind the tandem bike, Dan’s pulling a Chariot Bike Trailer. The Chariot is actually a child carrier, but we’re using it to pull our camping gear and food. We’ve had this bike trailer since Katia was about 1, and we purchased it second hand from someone in Ottawa. These things are almost indestructible, and considering the amount of stuff we’re carrying in it, I feel like sending the company a thank you note if this thing doesn’t burst by the end of the trip! Chariot is now called Thule, and they don’t make this particular model anymore. However, you can find all kinds of nifty trailers for active families on their website. Dan also has 4 panniers attached to his bicycle, where we’re carrying clothes and bathing suits for all of us. We’ve had the two blue ones (on the back of the tandem) since our Ottawa days back in 2007, and we purchased them from Mountain Equipment Co-op. I’m riding my regular bicycle, a Minelli hybrid I also purchased from R. L. Fletcher last year. I’m pulling an “Igo Two” Weehoo Bicycle Trailer. G-boy rides on the front, and he has pedals. These pedals are just for fun; they don’t help me on the ride. M-girl rides on the back, and her feet are secured on a little platform (no pedals). Both seats have seat belts, so if there are any bumps in the road the kids are secure in their seats. We also love that this trailer came with its own panniers as well. These are attached to the trailer and do not come off. They are great for storing our bike repair kit and bike-related items in one side, and snacks and treats in the other. We are all wearing super high-quality helmets that we got for free last year at the active fair in Kingston. This fair happens every year at the Wally Elmer Neighbourhood Centre, and it’s great fun for the kids. On a trip like this, you have to be mindful of what you pack, because we’re carrying it all with us. We’re still carrying a lot more than most cycle tourists, but we’re still figuring things out. We also need some extra items since M-girl is still in diapers. We’re carrying all of our camping gear, some clothing, and enough food for about a day and a half for all of us (we replenish as we go). Read more about our family adventures here. 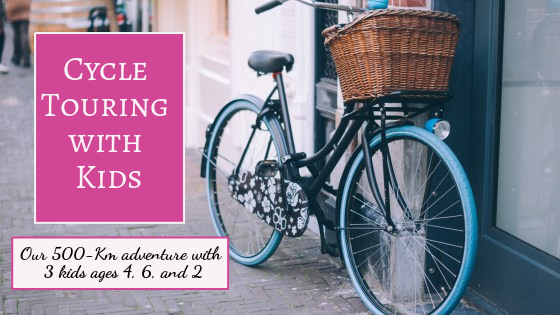 Next Next post: 4 Things We Should Have Brought on Our Cycling Tour With Kids – No. 4 is the most important! Thanks Aunt Cathy! We are having a blast!